Ok, I’m evil, I know it. My first semester teaching started last week and I’ve been SWAMPED ever since. So far: it’s ok. I think I’m pretty good at it, but starting out has been a little emotionally taxing. On top of that, I started my Masters program yesterday, so I’m stretched thin. It’ll all work out, though. Somehow, some way, it always does. And with that, on to cooking!! This recipe comes from Susan at fatfreevegan.com, and she’s usually spot-on when it comes to low-fat vegan cooking. It sounds tasteless, I know, but some of the stuff she’s come up with has been awesome. My dad’s birthday was this past week and (since he’s basically against-his-will vegan), I wanted him to have a nice cake that he’d like since he loves chocolate. The verdict: It’s ok. I followed the recipe to a T even though I saw it was a bit thick after I’d mixed in all the ingredients. It came out a little cornbread-ey and dry, so next time, I’m going to add 1/4-1/2 a cup of applesauce. I mean, you can’t go wrong with AS. AMIRIGHT? 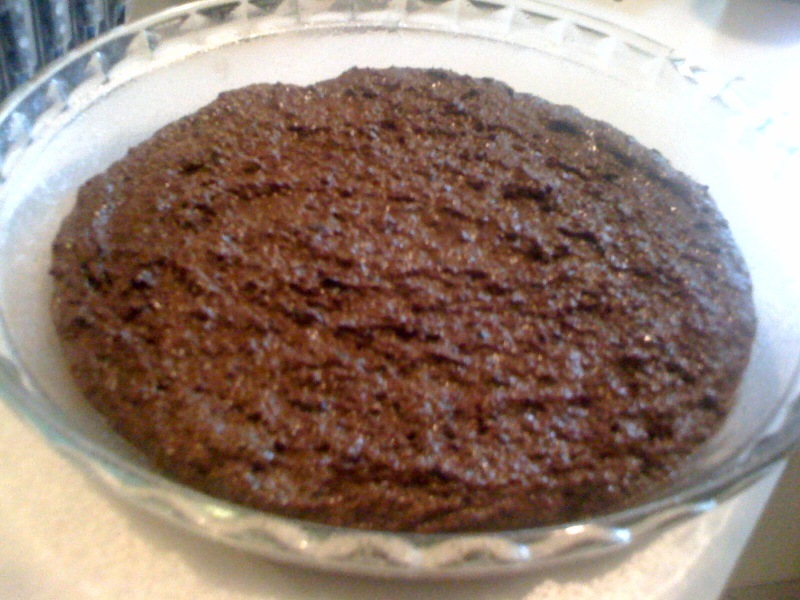 Preheat oven to 350 F. In a medium bowl, mix flour, cocoa powder, baking powder, baking soda, chia (or flax) and salt. 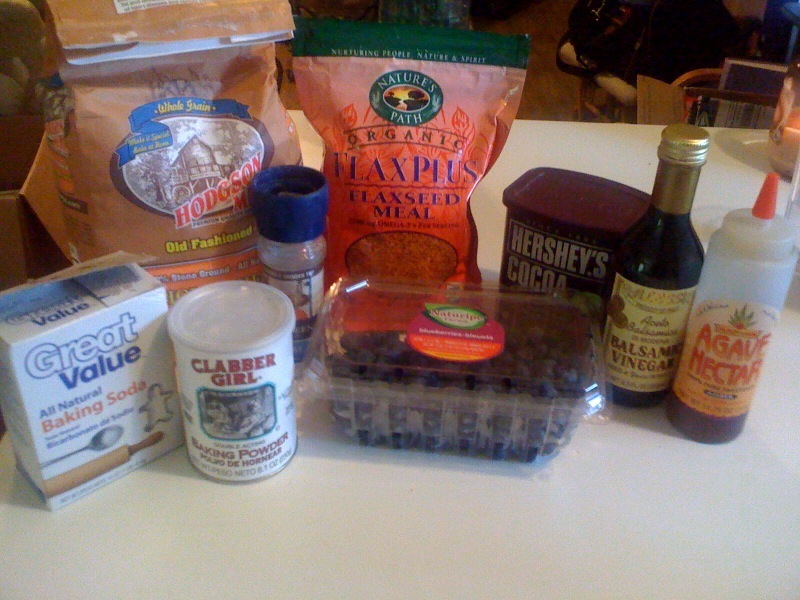 In blender, combine water, 1/2 cup blueberries, and balsamic vinegar and blend until smooth. Make a well in the dry ingredients. Add the syrup and the blueberry mixture. Stir until completely mixed. 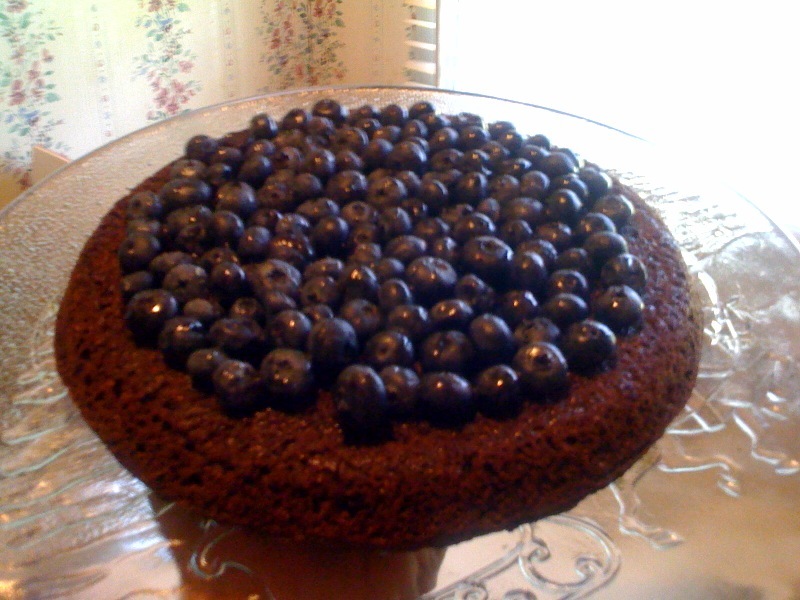 Pour into an oiled 9-inch round cake pan. Upsides: It’s pretty, it’s definitely chocolatey, and according to Susan, its: 144 calories per serving and 1.2 grams of total fat. Downside: It’s a bit dry.